Total production for the quarter ended Dec. 31, excluding its Libyan operations, was 267,000 barrels of oil equivalents per day (boe/d), while analysts were expecting 265,000 boe/d, according to Wells Fargo Securities. The United States has overtaken Russia and Saudi Arabia to become the world's biggest crude producer with daily output approaching 12 million barrels. Hess's average selling prices, excluding hedging, rose to $58.11 per barrel in the fourth quarter, from $57.32 per barrel a year-ago. New York-based Hess said it was expecting a yearly compound production growth of more than 10 percent through 2025, and will be able to break even on production even if Brent crude trades at less than $40 per barrel. Brent crude, currently trading at $61.95, fell some 35 percent in the fourth quarter. Hess stuck to its plan of spending $2.9 billion in 2019, up 38 percent from its projected spending plan for 2018. The company plans to spend most of that money on oil discoveries in offshore Guyana, where it is working on a project with Exxon Mobil Corp.
Guyana has become one of the world's most closely watched basins after Exxon discovered more than 5 billion barrels of oil and gas offshore. Commercial production is expected to begin in 2020, and output could reach 750,000 barrels per day. Net loss attributable to Hess narrowed to $4 million, or 5 cents per share, in the fourth quarter ended Dec. 31, from $2.68 billion, or $8.57 per share, a year earlier. 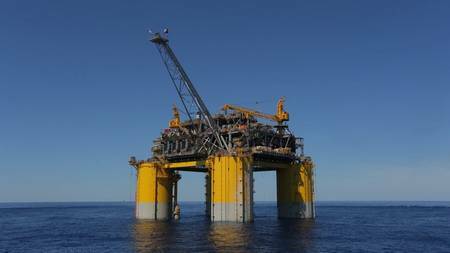 In the year-ago quarter, the company had recorded a non-cash charge of $1.70 billion, related to the reduction in value of some of its Gulf of Mexico assets. On an adjusted basis, the company posted a loss of 31 cents per share, while analysts were expecting a loss of 41 cents per share.